For the first time in 108 years, Wrigley Field is getting a new championship banner. The Cubs will play their home opener against the Dodgers on Monday night, and a special pregame ceremony will see the club's 2016 World Series Championship be immortalized at the Friendly Confines. It comes as no surprise, then, that the game will serve as the most expensive MLB game this week. The Indians, Braves, and Red Sox will also host top-priced matchups this week. The defending World Champions will open Wrigley Field on Monday night, and fans will be paying up to be on hand. The average resale price for Cubs home opener tickets are now $302 and the cheapest are listed from $117. They'll welcome the Dodgers, who they knocked out in a decisive Game 7 of the National League Championship Series last year. A series of home openers top this week's most expensive games list as the Indians play host to the White Sox on Tuesday. With the defending AL Champs returning to Progressive Field, Indians Opening Day tickets are averaging $229 and the cheapest available tickets start from $88 each. The Tribe will raise their AL Championship flag and distribute their league rings in a pregame ceremony. It's the beginning of a new era in Atlanta, with the Braves set to open SunTrust Park against the Padres on Thursday. The Braves will officially open the doors of their new, $622 million stadium, but fans can find some deals on tickets at the start of the week. Braves tickets at SunTrust Park currently own a resale ticket average of $204 and the get-in price is now $49. An AL East battle will commence at Fenway Park over the weekend when the Red Sox host the Rays. 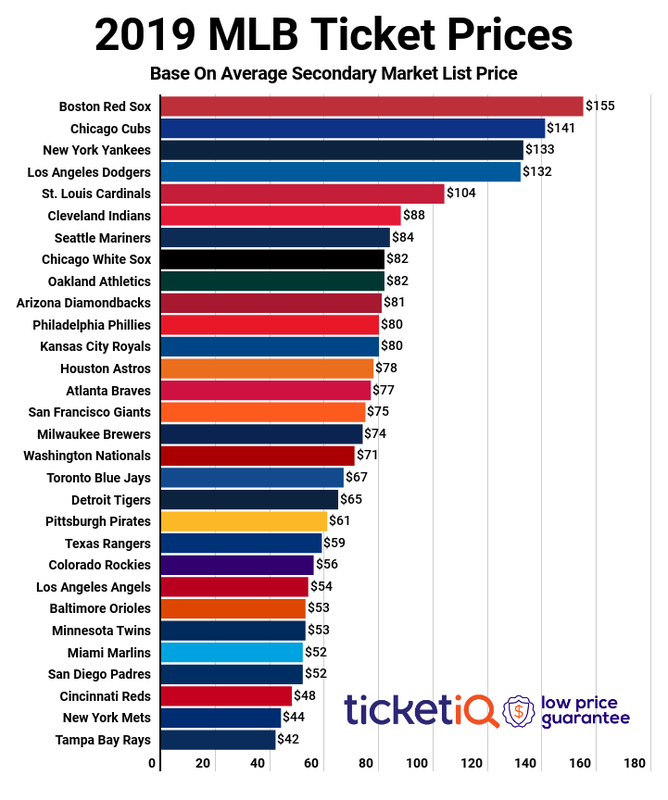 Sunday's matinee game will be the fourth most expensive game this week, with Red Sox vs. Rays tickets averaging $184. Fans won't have to wreck their wallet just to get past the gates, however, as tickets start from as low as $26 each. Rounding out this week's top MLB games list will be a mid-week battle between the Cubbies and Dodgers. Wednesday night's game serves as the fifth priciest game in the Majors this week at an average resale price of $155 and a $43 get-in price.